As contact lens professionals, we use the whole range of products that our industry partners offer. Standard contact lens designs fail in many cases because of difficult corneal and anterior eye topography, and individual designs can – and should – be used. Thanks to modern materials, lathe cut designs and individual software fitting programs, these lenses have an important role in our daily practice and should not be neglected. Here is a case from our practice in Zürich, Switzerland, illustrating that individual soft lenses are a ‘must have’ in contact lens practice. We achieved this successful piggyback lens fit with a custom designed soft portion with the assistance of one of our optometrists, Helga Seiler. A 42-year-old male with a diagnosis of pellucid marginal degeneration (PMD) had been a patient in our practice since 1999. 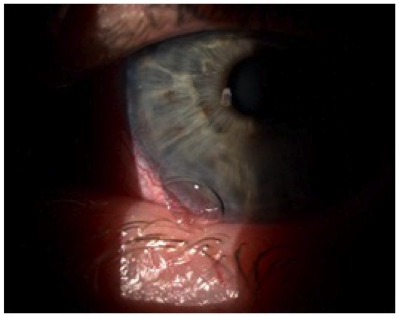 Progression of the PMD led to a corneal transplant OS in 2009. After removal of the surgical sutures in November 2010, we started fitting a contact lens on the left eye 6 months later. 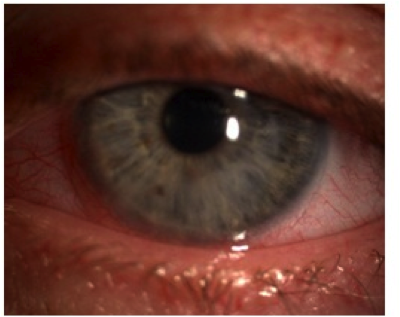 On his right eye he wears a multicurved, bitoric, quadrant-specific RGP contact lens that provides VA of 20/20. To improve vision OS as desired by the patient, we decided to fit a piggyback system. 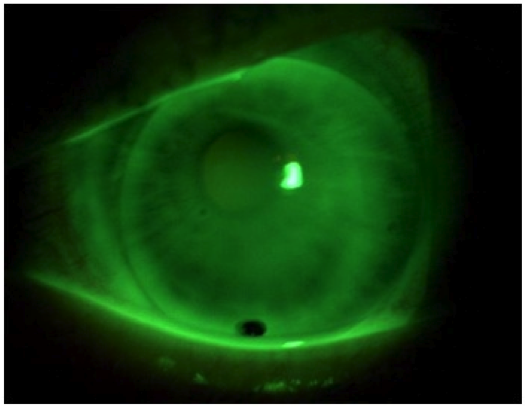 Corneal topography was obtained by keratography with the Oculus Keratograph. (Fig. 1). At first we tried to fit a daily disposable lens as the carrier beneath the RGP lens because we hoped to provide an easy system to the patient. As the overview (fig. 1) and the eccentricities (fig. 2) of the Oculus measurement show, the cornea was very steep in the center with additional steepening in the periphery. We were very skeptical about the success of a daily disposable lens in this case. We decided to try a daily disposable lens: One Day Acuvue Moist, BC 8.5 -3.0 14.2, which is one of the daily disposables that has a deep sagittal height. Nevertheless, we got the expected result: a large fold at the lens edge as you can see on figure 3, also sometimes described as ‘fluting’ in the international literature. Fig.3 : One Day Acuvue Moist with a very flat periphery and folding or fluting of the lens edge. Considering the results, we then chose an individual soft lens, TOPO S by Prolens AG (Zürich, Switzerland). This lens is available in a 2-curved or spheric back surface design and in a great variety of base curves, sagittal depths and diameters. Parameter AS2 means that the second curve of the lens is 0.2mm flatter than the central curve. Figure 4 shows a tighter periphery with the TOPO S lens compared to the previous lens. Over the soft lens, we fitted a TOPO Quadro RGP lens with a back toric lens design (Fig.5). With this lens system, the VA is 20/20 and our patient can wear the lenses for about 10 – 12 hours a day without any problems. This case report from our practice in Zürich Switzerland - regarding a successful piggyback lens fit using a custom designed soft portion in a post PMD eye undergoing a corneal transplant - illustrates that individual soft lenses are “must haves” in contact lens practice. Armin graduated in 1993 from the Schweizerische Hoehere Fachschule für Augenoptik (SHFA) in Olten, Switzerland and has been in private practice since that time. 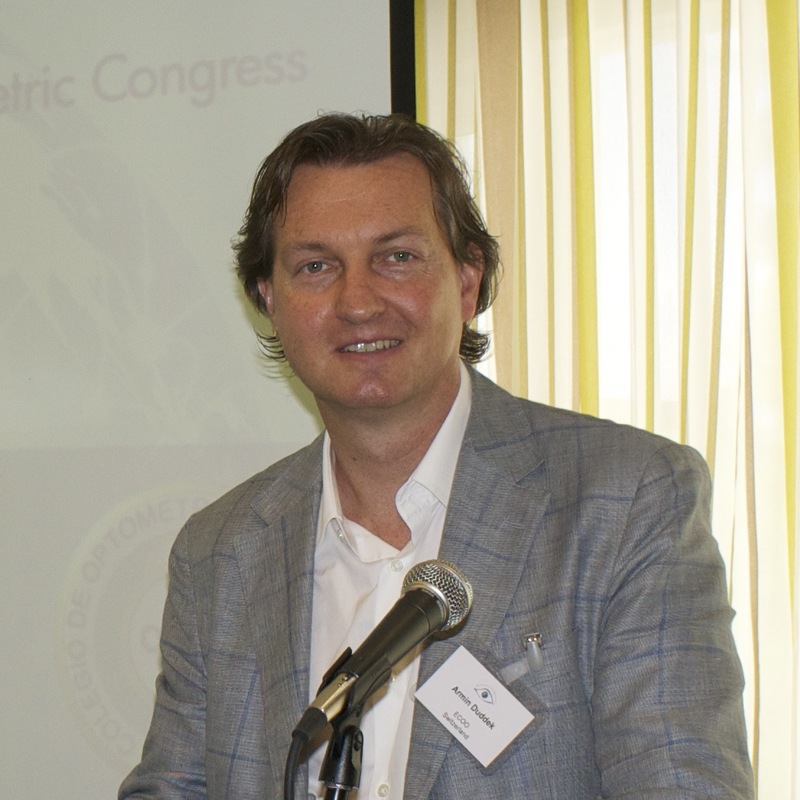 Since 2000 he has been the president of SBAO, SSO (Swiss Society of Optometry) and has been actively involved in ECOO (the European Council of Optometry and Optics). In 2010, he became president of ECOO.